Track legend Bill Bowerman famously coached his athletes to “run through the tape,” and with the University of Oregon nearing its $2 billion fundraising goal, President Michael H. Schill has announced the university will do exactly that. Schill said the primary focus of the new goal, developed through strategic planning with deans, faculty members and other campus leaders, is student success: access, support and optimizing the learning experience for students from Oregon and from all backgrounds. The UO also plans to seize new opportunities to benefit society through research initiatives and the completion of the Phil and Penny Knight Campus for Accelerating Scientific Impact. In addition, the UO will engage with faculty members in the liberal arts and humanities across campus to identify interdisciplinary programs to add to the campaign that will make enormous contributions to the state of humanistic knowledge. In October 2014, with an interim president and a newly independent board of trustees, the UO announced what was then an audacious goal of raising $2 billion to strengthen the university in ways never before considered. The university’s fundraising success and trajectory toward new levels of academic and reputational excellence have been made possible by enthusiastic donors. With the goal in sight, UO leaders engaged deans, donors, faculty members and students to identify priorities, pockets of opportunity and aspirations for the campaign extension. What arose was a foundational principle that the university must continue to expand efforts to ensure student access and success. The UO aims to raise hundreds of millions of dollars for scholarships, advising, support for faculty members and new opportunities outside of the classroom, while striving for excellence in teaching, resources and facilities. Long-term, endowed support for PathwayOregon, the groundbreaking program celebrating its 10th year that pays tuition and fees for qualifying Federal Pell Grant-eligible Oregon residents. More than 5,000 students — more than half first-generation college students and a large percentage of underrepresented students — have benefited from this program in the last decade. Increasing merit-based scholarships such as the Presidential Scholars program, which awards up to $9,000 per year for high-achieving Oregon students. To secure the best and brightest young scholars, prioritizing scholarship support and reducing the higher differential tuition for the Clark Honors College, which is ranked among the top 10 public honors colleges in the country. Pipeline programs, such as the Summer Academy to Inspire Learning, for students who might not otherwise consider themselves college ready. Advising and employment programs in the new Willie and Donald Tykeson Hall, scheduled to open in 2019, with its emphasis on college and careers. Continued growth of experiential education programs to give students hands-on learning and research experiences that position them to quickly move into the job market. A new 60,000-square-foot classroom building, with a focus on environmental and sustainability programs. Funds for long-term staffing and programming for the Black Cultural Center, which will break ground in October. In academics and research, the university will pursue new funding for the basic sciences, interdisciplinary projects in the humanities and social sciences, and the Presidential Science Initiative. The science initiative focuses on improving human life through neuroscience: the science of brains and behavior; materials science: chemical building blocks; data science: understanding and extracting knowledge; and microbiome science: health and well-being. A third pillar of the extended campaign is to complete fundraising for the Phil and Penny Knight Campus for Accelerating Scientific Impact. The ambitious project has begun construction on the north side of Franklin Boulevard and has raised more than half of its $1 billion estimated cost. “The University of Oregon is at an inflection point,” Schill concluded. “Extending the campaign by $1 billion is an important way to leverage the creativity, curiosity, talent and innovation of our faculty, staff and students across this campus in transformational ways; to send the message that we are bold, independent innovators who will not be defined by our history or preconceived notions of what it means to be a public university. Need-based financial aid. Sixty-five percent of all undergraduates receive some form of assistance. Prestigious merit awards including expansion of the Stamps and Presidential Scholarships. Funds for student employment in the UO libraries as well as the schools and colleges. Help for families sending their first student to college through PathwayOregon and other financial aid. Twenty-nine percent of Oregon freshmen will be first-generation college graduates. Assistance for student veterans, students in emergency hardship situations, students engaged in travel and experiential learning opportunities, parent and family programs, and more. Renovations of Pacific Hall into science labs; Chapman Hall, home of the Clark Honors College; Hayward Field; and the Allan Price Science Commons and Research Library. Berwick Hall, new home of the Oregon Bach Festival. The Black Student Cultural Center; the $2.5 million project breaks ground in October. Willie and Donald Tykeson Hall, the $39 million hub for the College of Arts and Sciences and the career center. New endowed faculty chairs in biology, chemistry, business and education. Through the campaign the number of endowed faculty chairs has grown by 37 percent. Endowments for two of the UO’s four named deanships. Phil and Penny Knight Campus for Accelerating Scientific Impact. Contributions to new academic programs in the College of Arts and Sciences, Clark Honors College and all five of the UO’s professional schools and colleges, with major donor investments in obesity prevention, volcanology and zebrafish research. 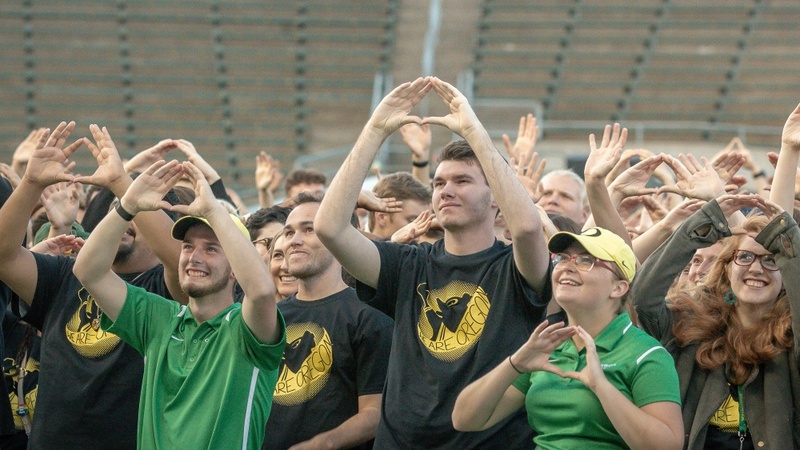 As of June 30, the UO’s endowment grew to $900 million (returns, plus cash gifts, minus distributions), an increase of $288 million since the public launch of the campaign in 2014.